It's where you share coffee with a friend, celebrate an occasion, gather your family, host your bridge group, but most importantly, it’s where you control your own schedule. It’s where your senses are tickled by the aroma of your favorite dish, singing a special tune, or sinking into a comfy chair and revel in the warmth of the fireplace or snuggle your pet with none of that needs to change! We combine the best aspects of living on your own without the concerns of running a household. Our flexible dining plan, enriching activities, regular transportation, pet-friendly environment and ready assistance are just part of the appeal. With three floor plans, apartment sizes range from 512 - 885 sq. ft. All 46 apartments are on the ground floor and have private patios. Our scale to size layouts and furniture cutouts make it easy to see how your pieces would best fit. Helping you keep a sharp mind, an active body and an engaged spirit are inherent in Stillwater’s activities for vibrant living. Daily, yes - even evenings and weekends, Stillwater has activities for group interaction. We host performances, discussions and lend our time to volunteer opportunities. Our resources and staff accommodate your individualized health and wellness plans. Your peace of mind comes from knowing help is near. Whether in your apartment, on your way to an activity or out walking the grounds your own Response care pendant can summon assistance. Bathrooms also have an Emergency Response Pull Station. Family members, too, can check out the facilities’ activity calendar and newsletter online at our website. A personalized portal also permits communication with your extended family of Stillwater staff to ask questions, share concerns or touch base despite time or schedule differences. Our common areas include a coffee bar with refreshments and snacks for your enjoyment anytime. Our private dining room may be reserved for your special gathering. An onsite beauty/barbershop offers weekly appointments. Each week we provide regular transportation for shopping and banking. Individual transport for medical appointments can be arranged. Though we can’t predict the future, Stillwater can help with planning future finances. Unlike places that raise costs as residents require more levels of assistance, Stillwater residents pay the same monthly fee even when additional assistance is required for daily living needs such as bathing assistance, mobility issues or medicine assistance. Likewise 3 meals a day, all drinks and snacks offered at the coffee bar, weekly housekeeping are included. Concierge fees will apply in the following circumstances: Staff may accompany residents for their medical appointments. Transportation for an individual appointment or special excursions. 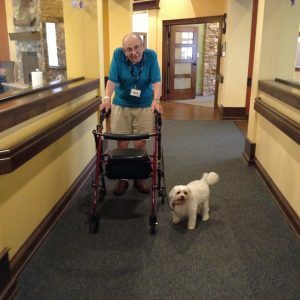 Aiding resident pets with exercise, hygiene or vet appointments. Embracing generations through listening hearts, compassionate care and purposeful activities modeled in Christ’s love.